2009 witnessed a dramatic increase in trade for great British holiday destinations. And it’s hardly surprisingly when you consider what it has to offer. Draped across a series of rocky hills overlooking the sea, Edinburgh’s buildings and monuments hovering on crags are overshadowed by neighbouring cliffs. 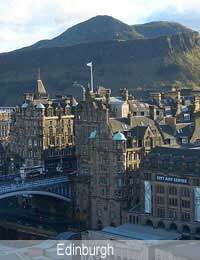 It boasts the Edinburgh Festival and combines the cultural city of crowded pubs and decadent restaurants with the history of Edinburgh castle and a mixture of medieval and neoclassical architecture. This coastal Cornish town bills itself as ‘the experience capital of the UK’ and its safe, sandy beaches are now renowned for their surf. Away from the water, Newquay has a lot to offer the visitor and holidaymaker. Families may enjoy attractions like Newquay Zoo, Blue Reef Aquarium, Waterworld and Oasis Water Fun Park; while destinations like Trenance Gardens and Leisure Park, Dairyland, Trerice Manor and the Japanese Garden & Bonsai Nursery may be favoured by those looking for more relaxation during their holiday. The area has superb facilities for surfing, sailing, riding, tennis, golf and fishing. And it’s also ideal for walking, cycling and wildlife watching. For those looking for a really active holiday, Newquay International Surf Centre is located on Fistral Beach. With a wide range of bars, pubs and clubs Newquay also offers a great night out, including a growing list of live music festivals, making this the perfect destination for relaxation or activity on the Cornish coast. Compact and easy to get around, there's always something new to see and do in the city. There are historic and modern buildings to visit, world-renowned museums, a fantastic theatre and live music. Cambridge is an incredibly family-friendly destination with a host of attractions to keep everyone happy. This great British city has one of the oldest British universities and includes a selection of architecture and heritage as well as museums and galleries. Or maybe seek out the ancient Egyptian art of Zebra skeletons as an unusual part of your holiday experience. There are opportunities to relax in one of Cambridge’s many parks and gardens or visit one of the numerous venues for film, music, dance venues or theatres. Canterbury Cathedral is the Mother Church of the Anglican Communion and seat of the Archbishop of Canterbury as well as a magnificent example of great British architecture. Examine the venue where Thomas Becket was murdered and the destination of thousands of pilgrims as told by Geoffrey Chaucer’s Canterbury Tales, which itself is situated near the Cathedral. Set near the North Downs Way, Canterbury also offers river tours, St. Augustine’s Abbey, a Norman castle and a Roman museum as part of its footprint of British history, as well as an emerging reputation for wine from the nearby vineyards. Its place in sporting heritage is sealed by its home to Kent County Cricket Club for over 160 years, the ground is set in 12 acres of the beautiful Kent countryside, which also houses the nearby Howletts Wild Animal Park. Within a stone’s throw of Canterbury, Whitstable has its own special British seaside identity and is the famous home of British oysters. As well as being a stop-off to and from continental Europe, Canterbury is near the British holiday destination of Herne Bay and The Blean, one of the largest and most distinctive areas of ancient woodland in England. York Minster is the north’s version of Canterbury Cathedral and is deputy to Canterbury’s authority in the Anglican Church. See the Gothic architecture of one of the largest cathedrals in Northern Europe. Away from the religious history of York, its social history is recorded by the York Dungeons, which charts a history of York through the Vikings, the plague and every gruesome aspect of the York past. Similarly there’s The Jorvik Centre, which is built on the Viking-age city of Jorvik plus the annual Jorvik Viking Festival. York is also home to various museums including The National Railway Museum and the Castle Museum. Why not visit one of the tucked away houses and halls dotted around the city, go to York Racecourse or enjoy the delightful architecture among the bustling shops of The Shambles. To unwind, take a boat along the river, day or night, or visit the York Theatre Royal to end the perfect day in one of Britain’s best loved holiday destinations. The birthplace of William Shakespeare and home of the Royal Shakespeare Company is home to five houses associated with the author as well as a wealth of other history. Enjoy the local scenery and fascinating places to visit once you plan to stay in the Stratford area, either by taking in the gardens while walking along the River Avon, or hiring a boat to experience the surroundings from a more leisurely perspective. The Butterfly Farm offers a tranquil alternative to shopping in the numerous boutiques and gift shops or take in a visit to Falstaff’s Experience, a living museum. The nearby surrounding shire counties of Oxfordshire, Worcestershire and Gloucestershire place Stratford in a prime spot in the English countryside, which makes it a popular British holiday destination. Blackpool’s cheap and cheerful attitude has recently been taken over by stag and hen parties, but is still a good value British holiday and has a good entertaining nightlife. As well as Blackpool Tower, the Golden Mile and Pleasure Beach attract people of all ages. Blackpool is the top UK summer holiday destination 2009 according to The Telegraph. Northern Ireland’s oldest city has been its religious hub since the fifth century, so is teeming with religious buildings and monuments. It was close to Armagh and the famous Navan Fort archaeological site that St Patrick chose to set up the Church of Ireland cathedral – his base for spreading Christianity – and this heritage oozes through the city. For those seeking an active British holiday there is plenty of golf, fishing, cycling, walking and hiking on offer. Armagh also has a wide range of visitor attractions including Cathedrals, museums, family attractions, Country Parks, National Trust properties, a modern theatre and a great range of restaurants and bars. There are a numerous arts, sport, musical and cultural events taking place throughout the year. No matter what time of year you plan to visit the area there’ll be plenty to keep you occupied. You can shop till you drop then sample some local cuisine before catching a show at the award winning theatre or simply enjoying the craic in a local bar - the choice is yours. Gower Peninsula’s gorgeous sandy beaches and limestone cliffs are the perfect place for coastal walks and show why it was the UK’s first official Area of Outstanding Natural Beauty in 1956. It’s also a perfect advertisement for the variety of wildlife and stunning scenery the area has to offer. With fine beaches The National Waterfront Museum and the fact it boasts the best surfing in Wales outside Pembrokeshire and some of the finest beaches in Britain also helps its popularity as a great holiday destination. And for those who are led by mealtimes, the Gower has undergone a gastro-revolution with a plethora of high-quality hotels and restaurants to complement one of the most holiday destinations in Britain. Despite complaints about the weather, Britain has so much to offer – the history, the beaches and the landscape, all blended with the modern urban development of cities like Manchester and Liverpool.